It can't help its setting but the view in pretty much every direction is one of tarmac. Adnams Ghost Ship, Woodforde's Wherry, Doom Bar and Greene King IPA were the 4 slightly unadventurous cask offerings - I quite enjoyed my pint of Wherry for £3.70 a pint. If you like a pub with a miserable barman, loud music played through tinny speakers, overpriced food (although we didn't try it, the music was too loud! 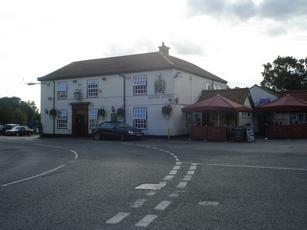 ), an outside sitting area next to the road and warm beer then this is the pub for you! A bit boisterous and locally, but friendly enough, a couple of Woodfordes beers on handpump in good nick. Would stop by again. Visited this pub a few years back whilst on holiday (we come from Sussex) Wonderful experience having fish and chips from the shop next door and being able to eat in in the beer garden on a sunny day with a glass of ale ! Will make a point of seeking out if ever in the area again. Visted Saturday, as no where to moor at Ludham Bridge, had to moor at How Hill. Needed to get some food so dispite looming darkness, took off with OS map in hand for the Kings Arms. After about a 40 min walk (I'm a very slow walker) arrived more relieved to see a pub than I have been for years! They were still doing food (thank god) so had a very good pub meal. Yes it is a bit 'local' but what do you expect. Pubs around this area are few and far between. Patrons were friendly enough, but the local moped club turned up about 9:30 pm (no doubt after x factor) so got a bit noisy and anyway, had a taxi booked for return to How Hill mooring. One route march was enough for me for one day! Nice enough place, beer reasonable, food good and hasn't been closed down like so many other country pubs.